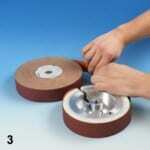 Intelligent solutions for grinding, polishing and deburring usually require specially developed tools. With the hinged contact wheel FAPI-METALL we contribute to the fact that an alternative for abrasive sleeve carriers can be used in companies. 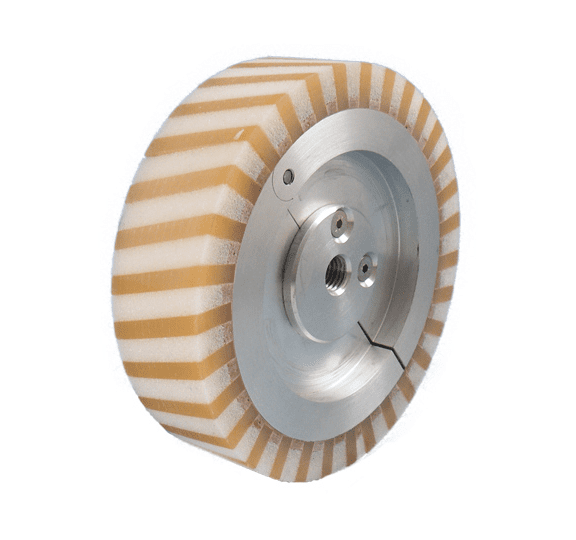 The criteria we set for the FAPI-METALL hinged contact wheel were a high-quality construction, cost-effective use and simple handling with the highest quality requirements. The required length of the backing abrasive can easily be torn off from a grinding roller and clamped into the hinged contact wheel. The purchase of abrasive rollers is many times cheaper than the purchase of abrasive sleeves The folding contact wheel FAPI-METALL reduces the costs for the permanent consumable “abrasive” to a minimum. Thanks to the simple folding system of the FAPI-METALL folding contact wheel, the used abrasive can be replaced with a new abrasive within a very short time. In addition, the hinged contact wheel FAPI-METALL can be mounted on any adjustable angle grinder in a matter of seconds due to the M14 thread. The system of the folding contact wheel FAPI-METALL impresses with its simple handling and optimal working results. The very simple change of abrasive and the simple installation on the machines mean that no handling errors can be made. 1. Open the hinged contact disc FAPI-METALL by loosening the screw connections. 2. After the FAPI-METALL flap contact wheel is released, you can open the contact wheel. 3. Tear off as much abrasive from a grinding roller as corresponds to the circumference of the hinged contact wheel FAPI-METALL of the required clamping length. 4. Guide the abrasive around the FAPI-METALL contact wheel and finally clamp it by closing the folding mechanism. 5. Screw the hinged contact disc FAPI-METALL back in place. 6. 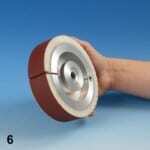 The hinged contact wheel FAPI-METALL is now ready for use. You can now mount the hinged contact wheel FAPI-METALL on the machine. 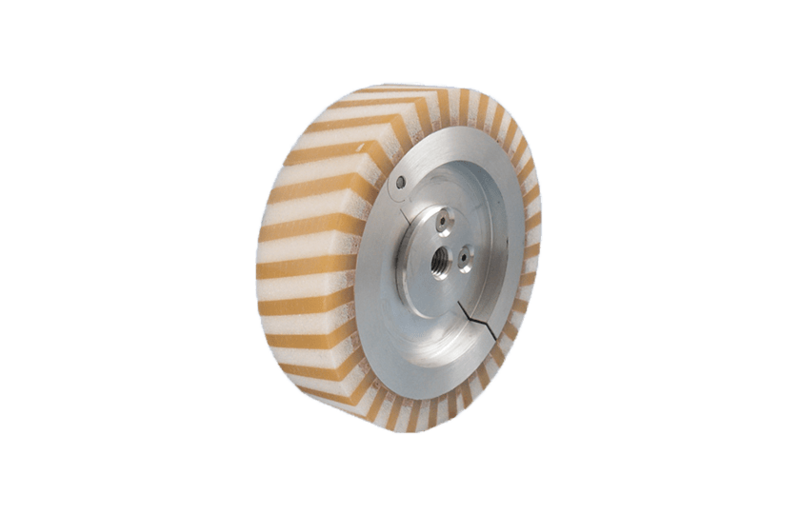 The FAPI-METALL hinged contact wheel is used in a wide variety of industries. Due to the simple handling, the applications are very wide. fold contact wheel FAPI-METALL 150 40 G 5/8"